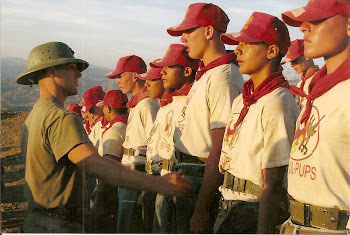 ALL CANDIDATES for 2013 Devil Pup camp at Camp Pendleton this coming July: Please be aware that the first PFT is this coming Saturday at the Washington County Sheriff's facility in Hurricane. 750 S. 5300 West, Hurricane, UT. Do your very best in each of the four events. Each candidate will need to complete TWO PFT tests, and we will take the best score when determining who qualifies to become a Devil Pup. 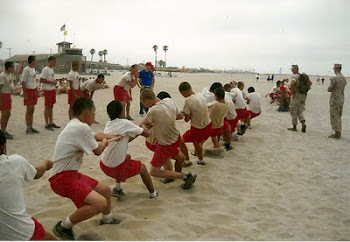 Once you've been through the first PFT, you will have a better feel for what you need to work on. The second PFT will be on May 25th, same time, same place - followed by a car wash. There will be a third PFT given for those who could not make one of the two regular PFTs, but anyone can also take the third PFT if he/she thinks it will improve scores. That one will be held on June 22nd, with another car wash following. Basically, you need TWO tests, but you can participate in three if you wish. Be aware that we have only six openings for males for SoUtah and two for females. So these PFTs are very important if you wish to qualify. This is a very competitive camp with lots of physical fitness stuff going on -- you will want to be in your best shape ever. 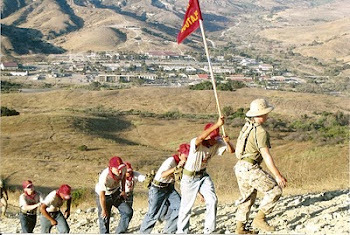 When discussing these events with your parents, please be sure they know that they are required to attend graduation ceremonies at Camp Pendleton on July 27th at noon. They will probably need to arrive in Southern California the day before in order to make it into Camp Pendleton prior to the noon ceremonies. Trust me, they will be so proud of you they will really want to be at your graduation! 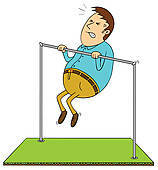 So - only a few days to work on sit ups, pull ups, push ups and running before the first PFT. What are you waiting for???? MEETINGS TONIGHT AND TOMORROW NIGHT!! If you are interested in learning more about the Devil Pup program and this year's summer camp, Col. Toole, Steve Handy and Jim Haney will be at the library in St. George tonight. Conference Rooms A & B in basement 88 W. 100 South. No reservations needed - just show up at 6:00 p.m. Parents and Pup Candidates can get their questions answered. If you haven't yet completed application papers, please bring them with you to the meeting. There will be a second meeting tomorrow night for those who could not attend tonight. 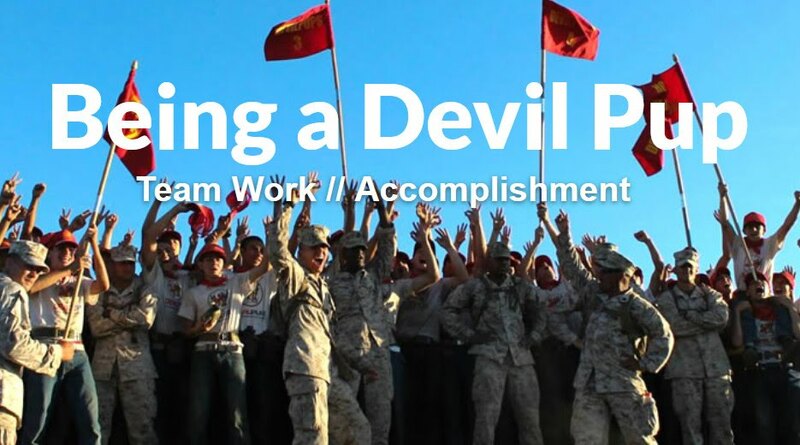 The first Devil Pup PFT for 2013 camp will be held on Saturday, April 27, 2013 at 8:30 a.m. Please arrive 8:15 a.m. Location: Washington County Sheriff's Facility, 750 S. 5400 West, Hurricane, UT. 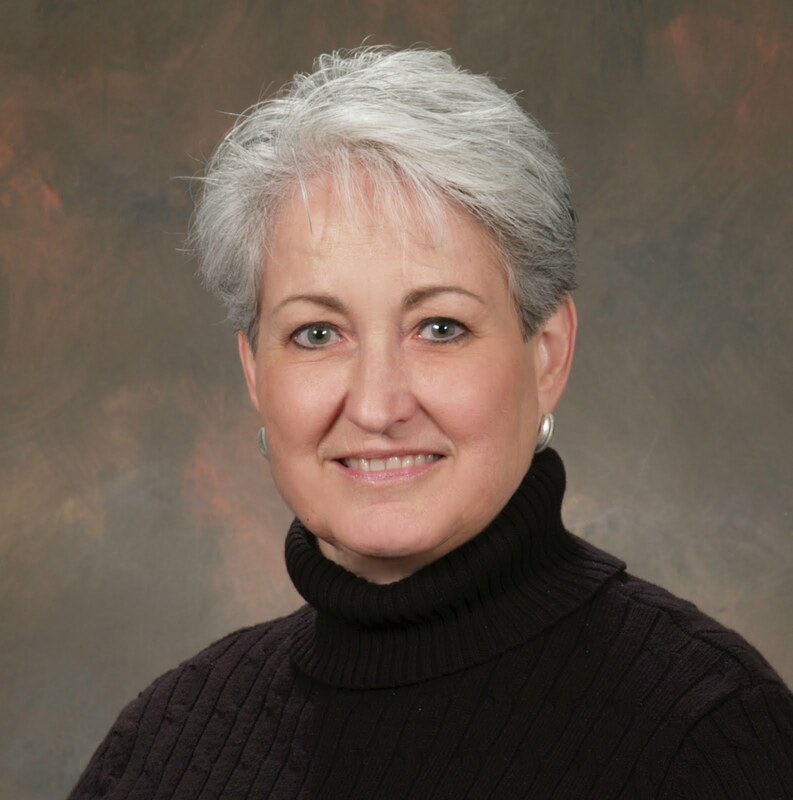 Parent meetings at 1800 (6:00 p.m.); County library Conference Rooms A & B in basement 88 W. 100 South. If you have not turned in an application, please bring the paperwork to this meeting. The application forms can be found on the Devil Pup, Inc. website at Devil Pups, Inc,. Please look at the left side, under the heading "Forms" and print them out. Bring the completed forms to one of the above meetings. PFT #1 at Washington County Sheriff's Facility 0830 (8:30 a.m.). 750 S. 5400 West in Hurricane. Hill Top Car Wash 160 N.100 East (near Denny's on the hill). Please note that two PFTs are required for each candidate. We will take the higher of the two scores in determining which candidates will be chosen to attend camp in July. For those who have a schedule conflict for one of the above PFT days, there will be a “make up” test date on June 22nd (below). There will also be two car washes held at the Hilltop Car Wash on St. George Boulevard. This is a major fund raising activity and each candidate will be expected to sell 10 tickets. You will be judged on selling tickets as well as washing cars. Rummage sale at Lin's Market 1930 W. Sunset Blvd 0800 (8:00 a.m. 2:00 p.m.). Round up rummage sale items from parents, grandparents and neighbors and be at the sale to help us sell, bag and load items. 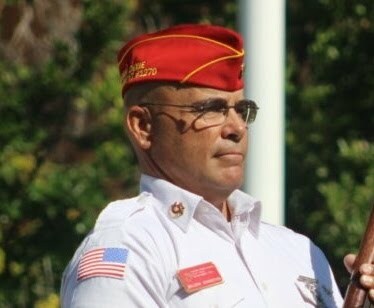 The Marine Corps League will sponsor this event. Transportation to Camp Pendleton departs Main St. movie theater parking lot at 0230 (2:30 a.m.). [That is 2:30 in the morning between Wednesday night and Thursday morning. Schedule a nap for Wednesday afternoon!] 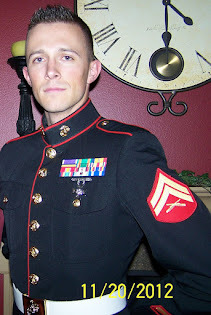 Muster time is 0200 (2:00 a.m.). 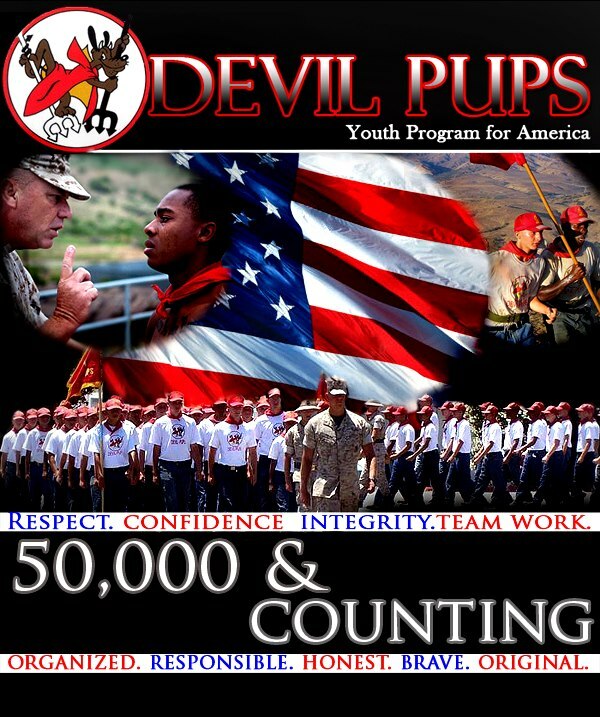 Devil Pup Graduation ceremony begins at 1200 noon PDT at Camp Pendleton, California. Arrival time suggested is 1030 at Basilone Road gate. Details e-mailed later. 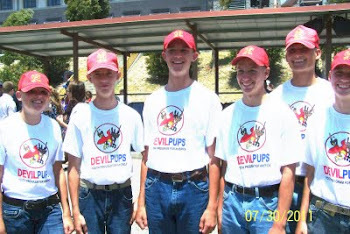 This blog entry contains information about parent meetings to gain an understanding of the 2013 summer Devil Pup camp experience. 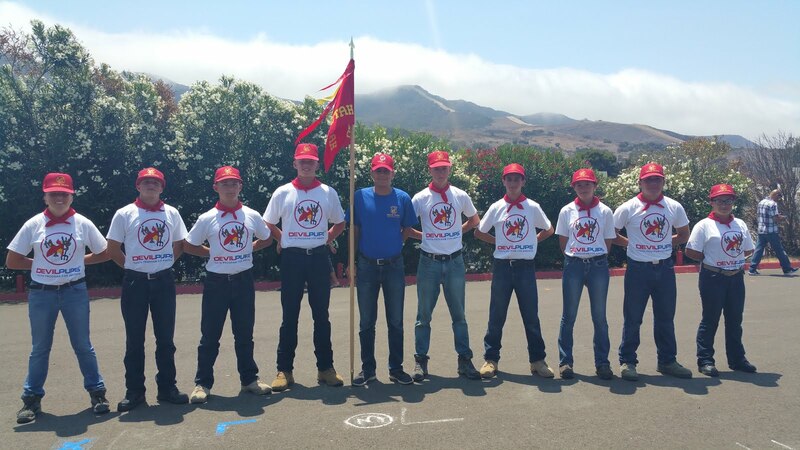 This summer's camp is from Thursday, 18 July, through Saturday, 27 July at Marine Corps Base, Camp Pendleton on the California coast, midway between San Diego and Los Angeles. We provide transportation to the camp, and respectfully request that the parents attend the graduation ceremony, as it is a peak experience in the young lives of their children. Parents are responsible for transportation home from Camp Pendleton. Before your permission can be sought, you might wish background information on the program. For that reason, we have set aside two evenings next week at which we can meet and enlighten parents on the value of this program in the development of their youngster. Although you may not have heard of the program, it has graduated over 50,000 young people over the years of its existence, after an intensive ten-day course whose motto is "Growth through challenge." Please choose one of the dates that is most convenient for your family. 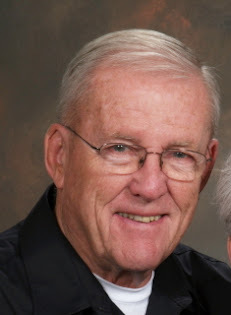 Both evening meetings begin at 6:00 p.m. in Conference Rooms A and B in the basement of the Washington County Library, 88 W. 100 So., St. George. The meetings convene at 6:00 p.m. and we must surrender the room at library closing - 7:30 p.m. You might want a notebook and pen for notes. My staff and I (all volunteers) are looking forward to meeting each of you. Col. Toole is in Long Beach, California, this weekend, along with Assistant LR Stephen Handy, to learn about the 2013 camp requirements and what the St. George quota will be this year. Stay tuned for details on parent meetings at the St. George library, dates for PFTs and car washes, and any further requirements. 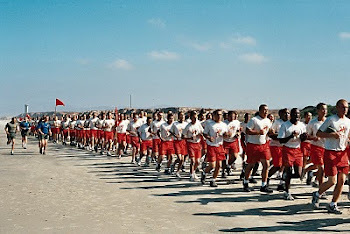 The list of applicants is long again this year, so all Devil Pup applicants should begin training now to max out the PFT. Col. Toole and Mr. Handy will be looking for good attitudes, good work ethics, a can-do, team work philosophy and, most of all, high PFT scores.